I apologise here and now for gushing just a little bit. 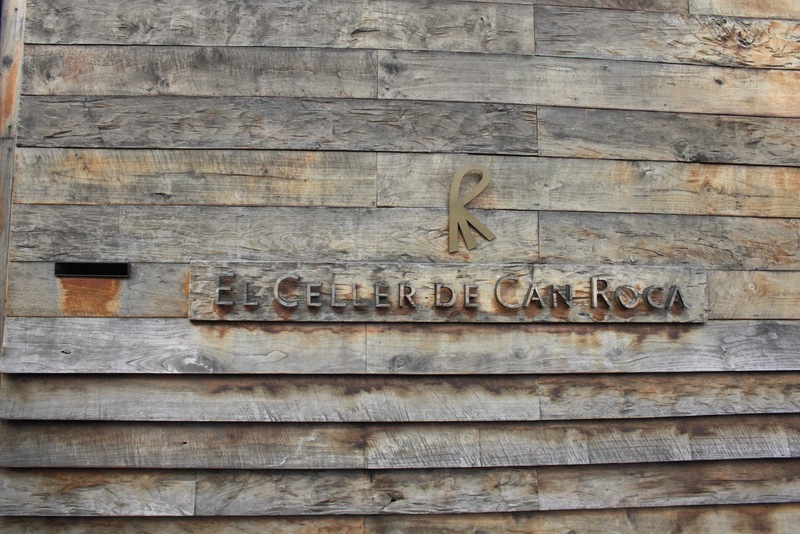 It seems only appropriate that 55 years of wonderful eating have brought me here to El Celler de can Roca (cellercanroca) in Girona, reportedly the second best restaurant in the world, on a sunny Friday in December. Pilgrimage sounds too reverential for something surprisingly homely and comfortable but for such an experience, worship is the only option. Landmark meals over the last half century or so all form pieces in my culinary jigsaw. Foie gras with a perfect Sauternes jelly at Simply Nico; inspirational meals at Dartmouth’s Carved Angel over 20 years of family visits; a lunch in Fulham when Gordon Ramsay was just the name of the talented chef at Aubergine; every meal eaten at The River Cafe; yet another birthday occasion at Le Manoir aux Quat Saisons with ex-husband Derek. The most memorable have left me wanting to stop time to savour them, to set them in the mind to revisit again and again. All have in common that perfect combination of people and location with outstanding wine and food. 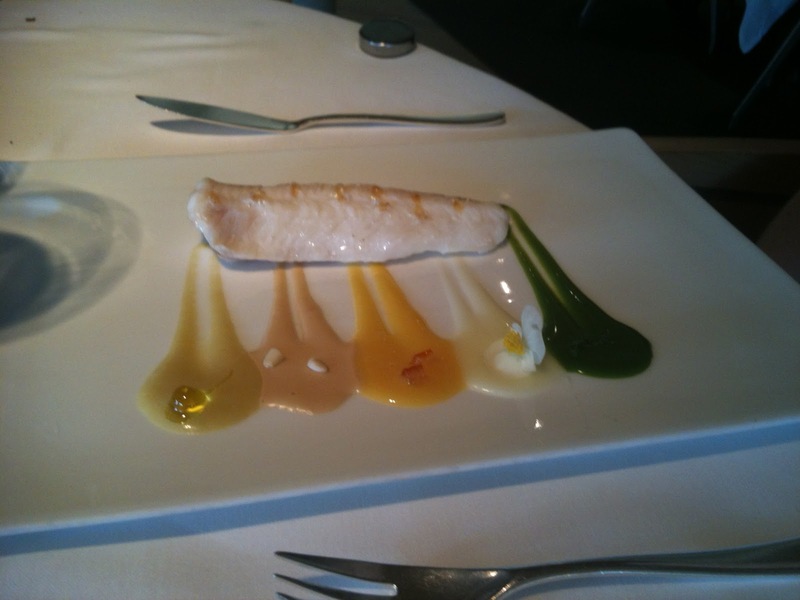 And then there is Spain; since my first visit over thirty years ago, always the touchstone for my own cooking. So many meals eaten there are lodged in my memory bank – chiperones and chilled tumblers of manzanilla in Sanlucar, an astonishing pork sandwich in Extremadura, tapas in San Sebastián; a memorable wedding with food on epic proportions over an entire winter weekend in Pamplona; linguada, croquetas and chuletas in Majorca. 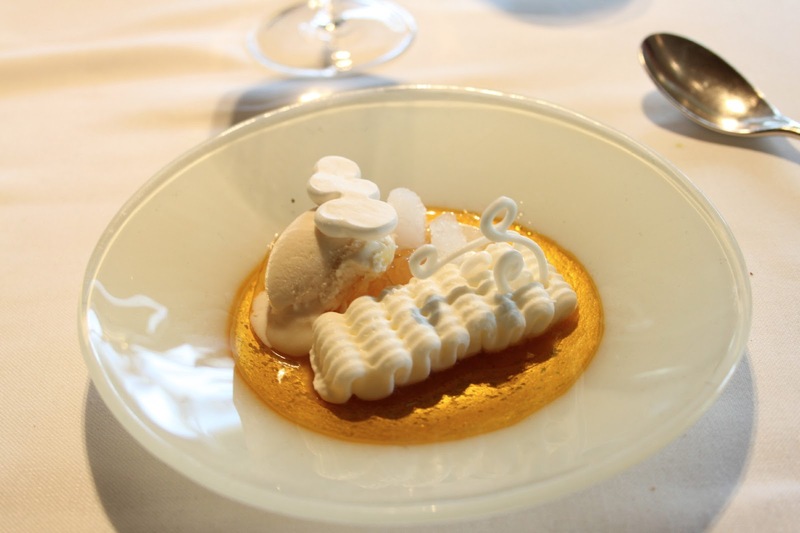 And somehow it seems all my Spanish roads led to that calm room in Girona – and so fitting to be taken there by my daughters – food and family as ever creating perfect harmony. 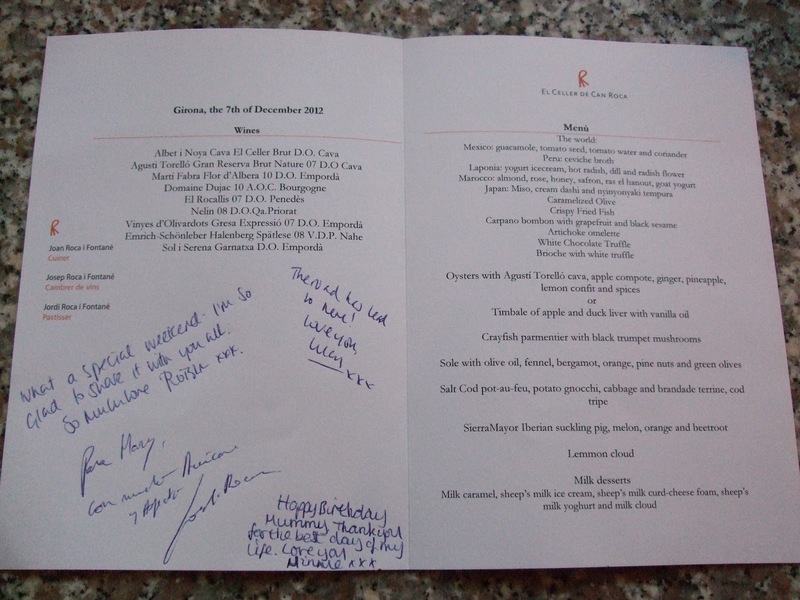 Five years ago I ran a cookery week at home for eldest daughter Lucy and three friends. Off to university, none had cooked at all, and all feared they never would, or could. Preparing and cooking food seemed a complex and inaccessible challenge. It was a week that changed everything for them as they discovered that everyday cooking is easy. And though I was not aware at the time, it made Roisin determined to work with food. Now she has been in Spain for almost a year and is currently working with a Girona-based company organising speciality food tours. Her boss helped book us our table at Roca, and, serendipitously, the date was for lunch on my birthday. And thanks to Roisin’s wonderfully meticulous planning, we had a wonderful 48 hour masterclass in Catalonian food and wine, all enjoyed to the full with a perfect sense of place. The local food the night before had set the scene – grilled meats, snails, butifarra and salt cod eaten in a small family restaurant. 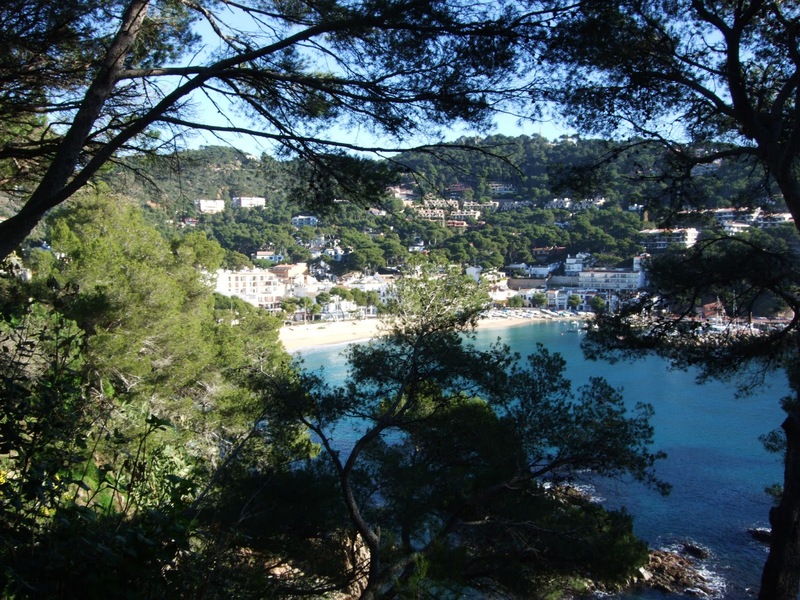 On the morning of the 7th, the beach at Calella de Palafrugell was a satisfying mixture of Eastbourne and Salcombe but with light and colour from Picasso etchings – trees in different greens, cold blue seas with sparkling highlights, whites, greys, blues. Of course now I realise why Catalonia is god’s country – it has mountains and sea in harmony. We slept with the backdrop of the snow-covered Pyrenees and walked by a fresh blue sea before lunch. And our food reflected that wonderful combination of place in one region, as the four of us debated mountains versus beaches over lunch. And this December landscape of clear light on tree trunks and pale blue skies – trees, sunlight and wood running through our visit, viewed from the car by the motorway, seen from our hotel room, pine by the beach – was ideally represented in the restaurant itself. Our taxi drops the four of us off in an unassuming residential area on the outskirts of Girona at a simple entrance of lapped wood wall, with no hint of what is hidden behind. We walk through an attractive wood-panelled terrace, the first of a series of rooms, set with tables and chairs. A glass wall runs down one side. Through a wooden door to a smiling welcome and then immediately on into a kitchen like a home – a slate wall of chalked notes on influences and ideas to our left, on the right eldest Roca, Joan, glasses on the bridge of his nose, benign and watchful, looking over his kingdom as he sits at his long desk surrounded by reference books and notebooks. He comes over to shake hands and nod and smile a welcome to these four English pilgrims. 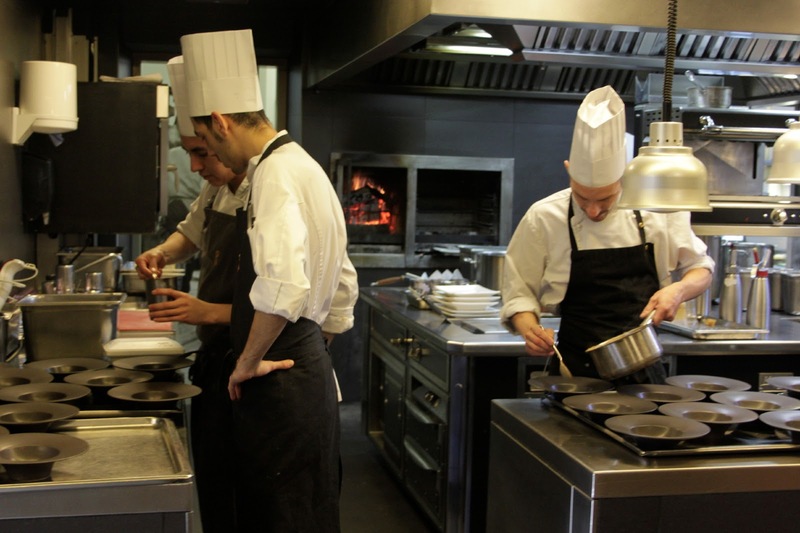 We walk on into a series of rooms opening onto each other – wood-fired oven, stainless steel surfaces workmanlike but not dominating, a brigade of attractive well-dressed chefs in a calm space. No obvious egos and all smiling and happy to welcome us there. The impression is of Willy Wonka style magic but it’s all somehow familiar and welcoming. 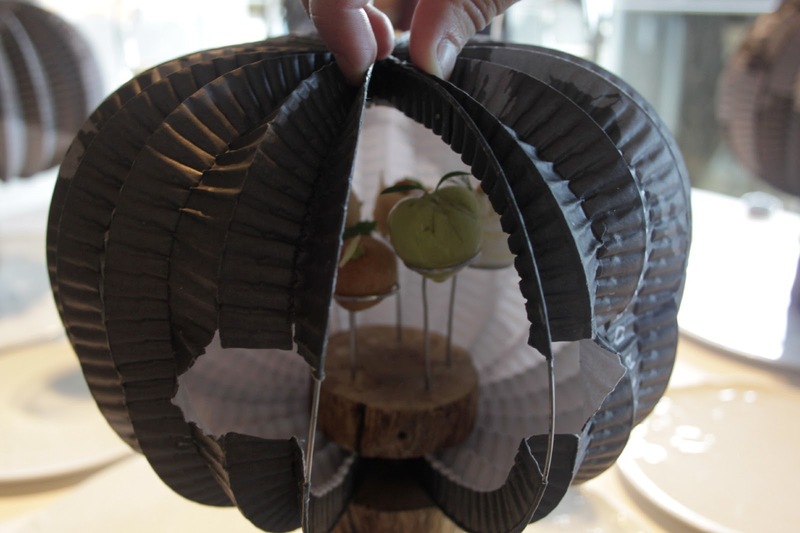 Then it’s back out and into the dining room, built around a triangle of birch trees enclosed in glass – bleached bark trunks with crisp ochre leaves covering the ground, and the winter sun raking in across the restaurant. Low ceilings, clear space around the tables, zen, calm, welcome – the atmosphere of every day eating but this is not every day. Clear glass, pale wood, dark suited staff – the colours are muted and natural throughout, the fireworks all come from the food. Other customers are a mix of families with babies having lunch, couples, a group celebrating a family event – all content to be there in what appears to be essentially the local restaurant. 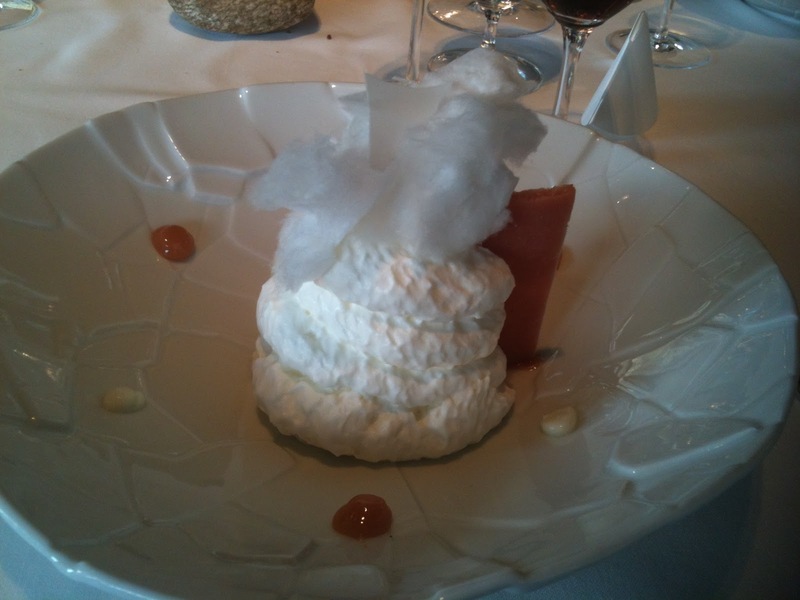 The only other time I’ve had a meal when at the end I felt I didn’t want to eat anything else ever again to spoil the memory, was the first time I went to the Manoir. On that occasion, I could have left after the canapés, bread, butter and wine and been totally satisfied. 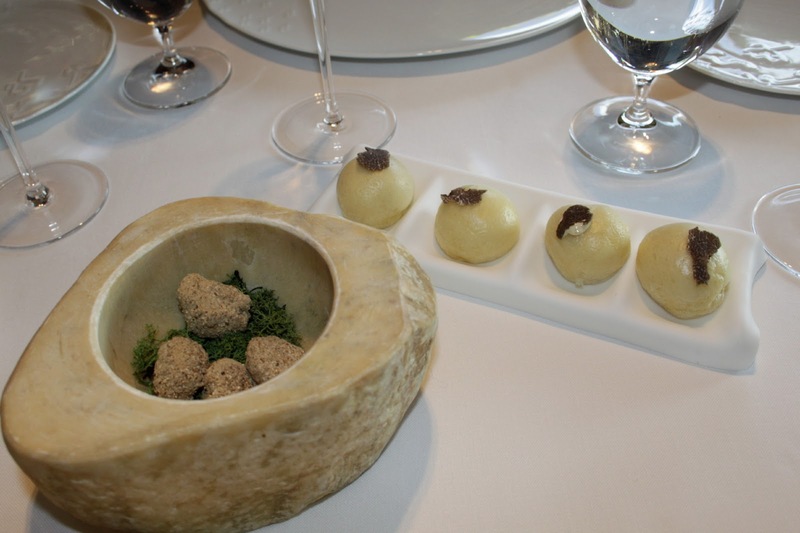 Here it’s the two earliest arrivals at the table – the first a globe of the world summed up in five canapés, with a quiz as to each origin adding to the sense of fun – that engender the same sense of complete satisfaction. Lapland, Peru, Morocco, Japan and Mexico – each mouthful is an explosive wonder, sparking memory. We start with Lapland – a frozen burst of horseradish and dill with perfectly acidic yogurt, then Morocco all almond and rose with my favourite Ras al hanout seasoning encased in light brique pastry. Peru is lime and fish – ceviche in a mouthful. Each one is entirely pleasing. And we all guess the locations correctly. 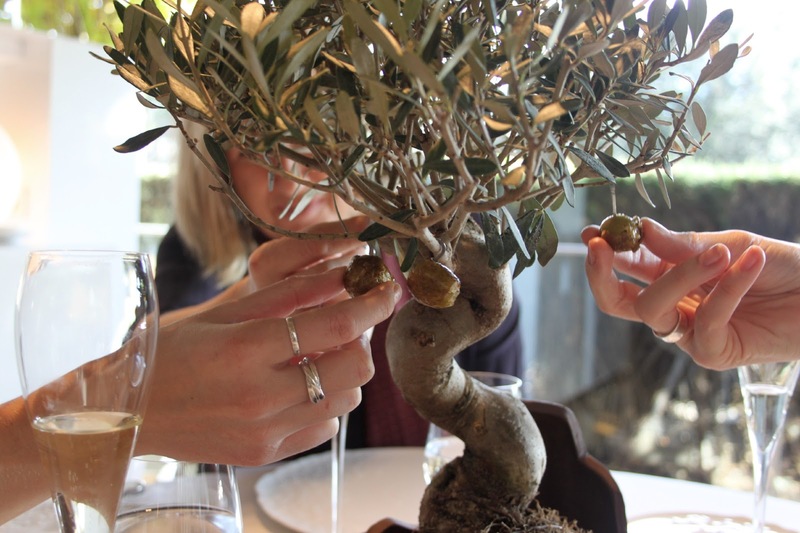 Then a miniature olive tree roots us back here in Spain. The crispy candy-coated olives we all stretch to pick are a perfect blend of sweet/sour/salt and bitter – and an education in taste and texture. They finally makes sense of my previous ambivalence about olives. So this is what they should taste like! The smiling waiter hands round a wondrous bread basket – extraordinary red wine bread with a distinctive deep colour, apricot and walnut but best of all a black olive Chelsea bun style twist – flaky yet crisp suggests use of lard and recalls my favourite breakfast ensaimada in Mallorca. 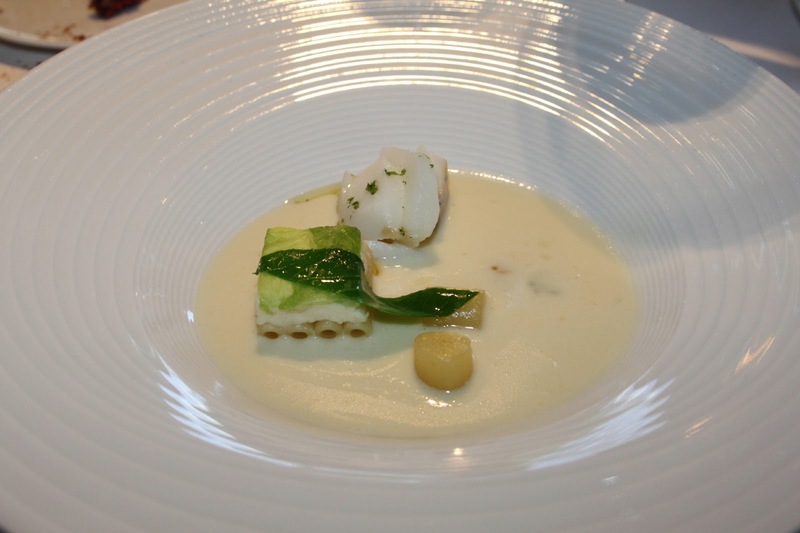 As the meal progresses more wonders continue to arrive without ceremony – each dish doing its own talking. As daughter Lucy comments with what feels like only a little hyperbole ‘If everyone ate this food there would be no war’ – and we all know just what she was trying to say. 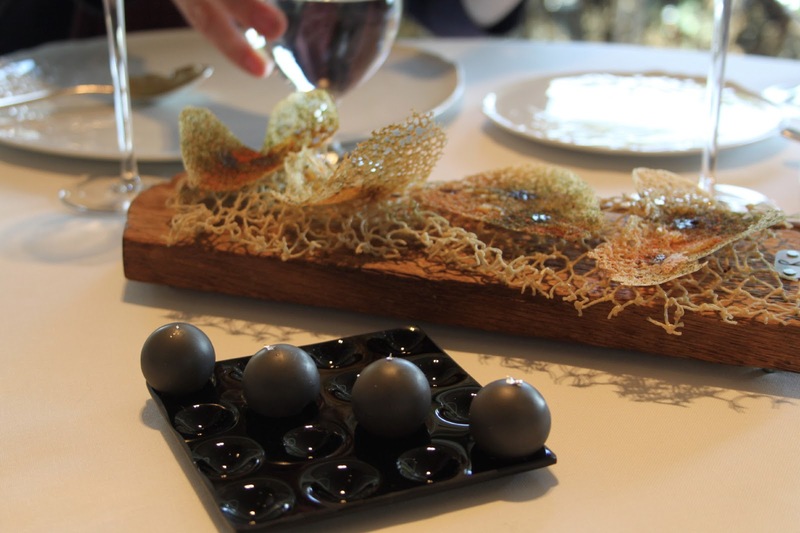 The food uses every tool on offer to the modern chef to create balance and pleasure. Cold and hot, soft and resisting, smooth and crunchy, small but intense- but always real food rather than laboratory creations. It’s subtle, restrained but intense which means you feel satisfied but not overwhelmed. And all served with that Spanish flair and lack of ceremony. So we feel cared for but not condescended to. The wonderful wines deserve a feature all to themselves but for now what stands out are the stunning white Bourgougne, the Priorat, and the luminous desert wine, a spatlese. 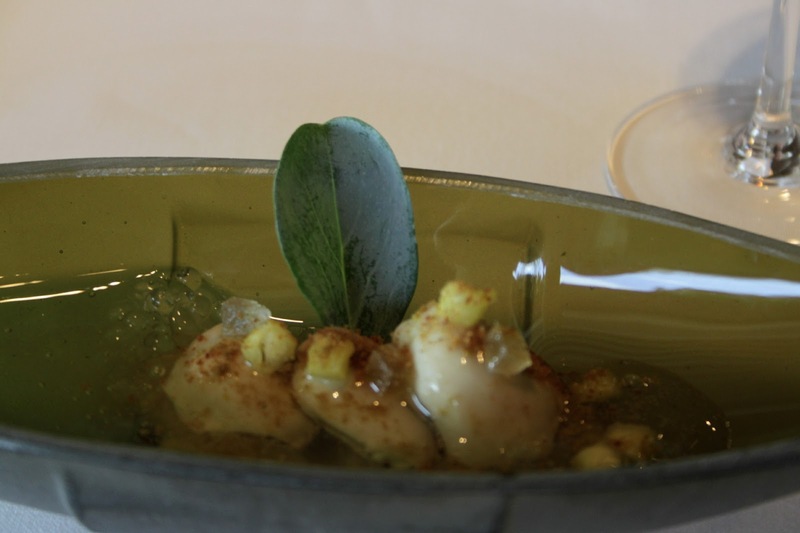 The sole – the essence of Spain. I think this is one of the best things I’ve ever eaten. Because it says everything about the place and ingredients. 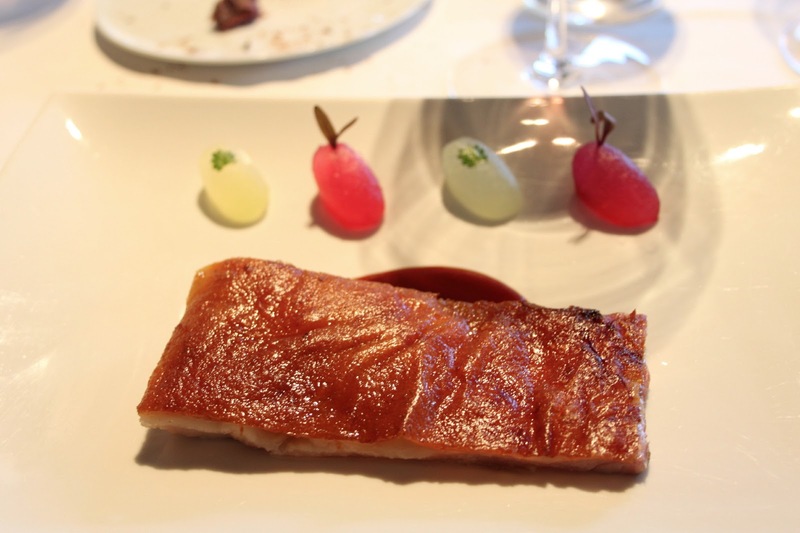 Suckling pig – soft, melting and not greasy; bursting with flavour of pig. 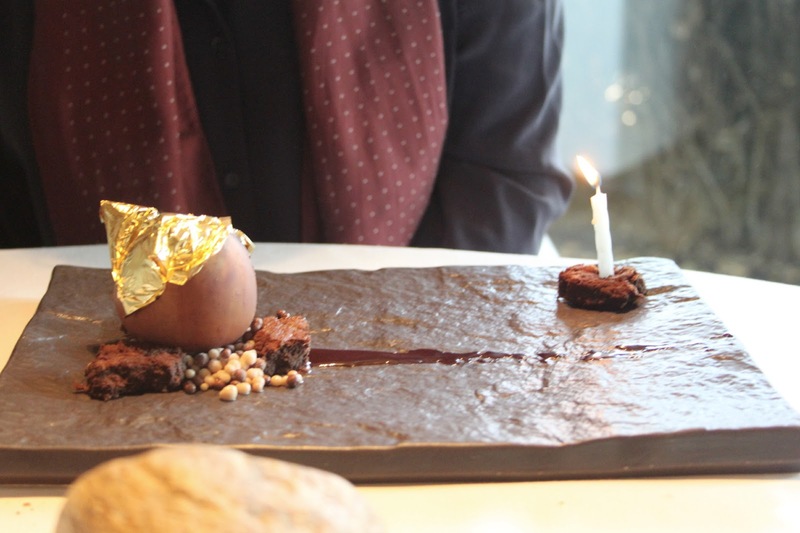 Birthday desert – a candle with a gilded chocolate sphere. 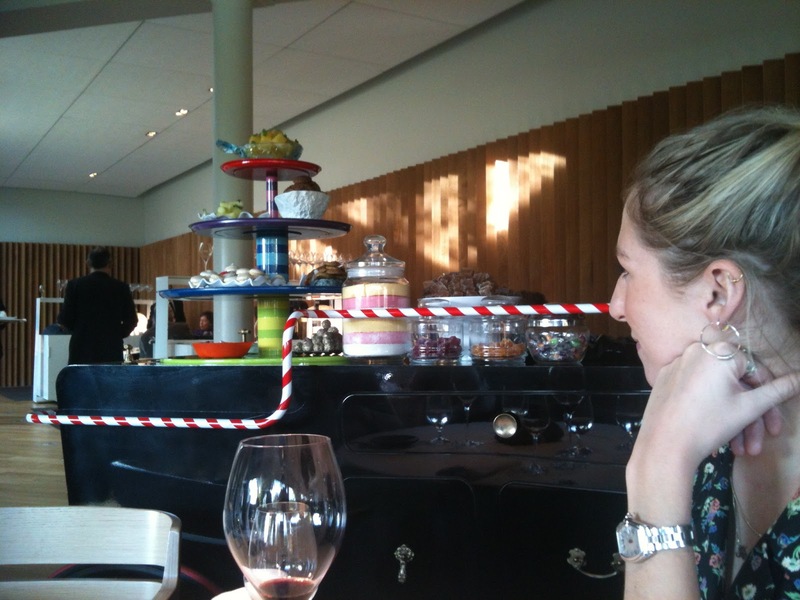 The sweetie shop petit-four trolley is rolled up providing the only bright colours in the room. The waitress nods and smiles to us like a summer ice cream seller on the beach. Back into the kitchen to meet Jordi – like a smiling but self-effacing elf. He and his cohorts seem humble and happy to cook to make people happy. We try to say thank you but language means we are restricted to smiles and nods. But we all understand why we are there together. The Rocas know that essential truth – families that eat together stay together. Family and food – it’s all there is in life. We leave walking out into late sun not drunk or overfed but smiling and replete. Serenity and satisfaction with a real sense of wonder. Thank you girls and Roisin. And Roca…..